This window will appear after commanding events to import from an ics file, if the destination calendar contains events that weren't found in the imported file. When importing an ICS file to a destination calendar, via the Import Calendar window, the Delete/Overwrite Events window will be shown if the destination calendar contains existing events that do not appear to match any of the imported events. 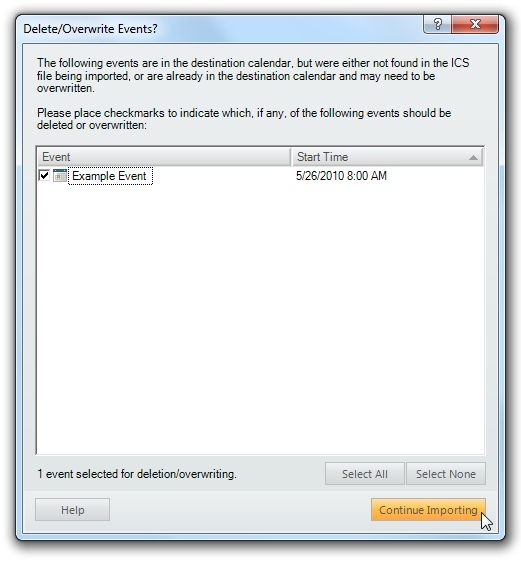 This enables you to pick and choose which existing events should be deleted or overwritten with data from the ICS file. This is useful if you have an existing calendar that you've added events to, and want to add some additional events by importing from an ICS file, without losing events previously entered. To select which dates should be deleted or overwritten based on the contents of the ICS file, use the checkboxes in the list. Any events that have a checkmark will be deleted or overwritten. You can use the 'Select All' and 'Select None' buttons to toggle checkmarks for all events in the list. The list can be sorted by event title or starting date, by clicking the column header. When you are satisfied with your selections, click the Continue Importing button to complete the import. If the window is closed without any events selected (all unchecked), all existing events will be preserved in the destination calendar, and new events will be imported from the ICS file. Note, this may result in duplicates of an event, if the same event exists in both the destination calendar and the ICS file. If the window is closed with all events selected (checked), the destination calendar will match exactly the contents of the ICS file. Any events that previously existed in the destination calendar will be deleted or overwritten. You will be prompted to confirm. If the window is closed with some events checked, and others unchecked, only those events that were checked will be deleted or overwritten. The unchecked events will be preserved in the destination calendar.